Just one garden pot can hold an entire garden in miniature, a world of plants as visually compelling as a mixed bed and yet far easier to manage. That really is the beauty of containers. You don't need a big space to make a huge impact. 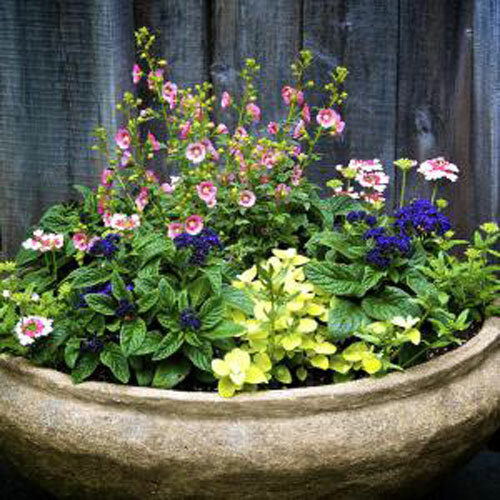 What you do need of course are fantastic garden containers of different sizes, styles and colors. There are so many different varieties to choose from in today's marketplace. Terracotta which is traditional, poly-resin for weight, concrete for durability and much more. 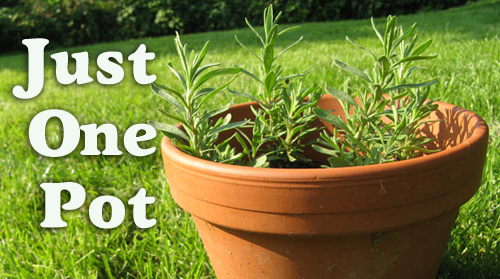 When it comes to selecting the plants to pot then you need to make sure you get the ones best suited for the area you are going to place the potted container in. When planting in the Southwest you can always go with the super durable cacti and succulents. A spiky aloe vera is lovely and grows rather large in most containers. For best drainage make sure the potting soil is formulated for cacti and not just ground dirt. Make sure your containers have drain holes so the roots aren't sitting in standing water, which will rot them and use a granular slow release fertilizer at planting time. Water just once a month or so and you will have great success. 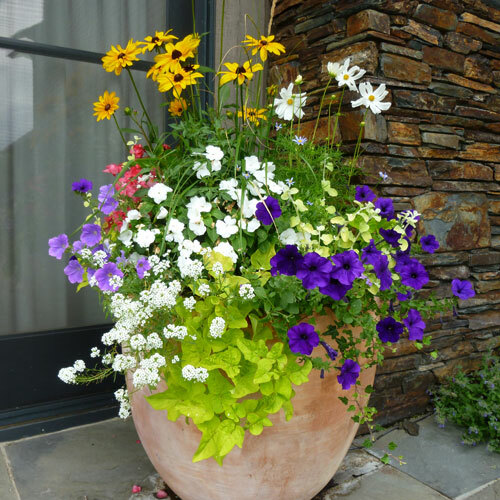 If you live in the Northwest part of the states you can use a variety of colors and forms in your potted containers. Feathery branches and variegated shrubs add lots of texture and design. 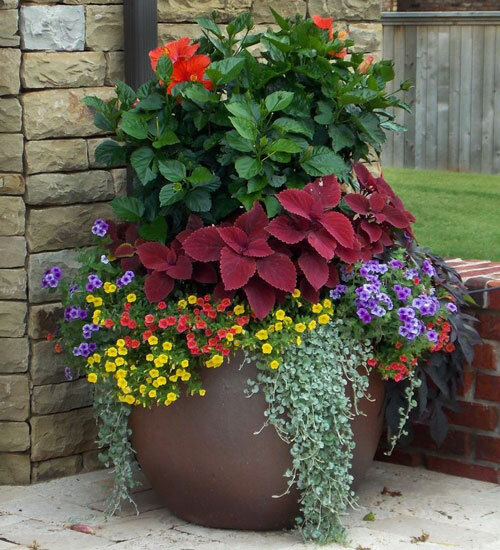 Pot hits of color with dark and brights shades of red or burgundy. An initial handful of slow release fertilizer is all you should need to get the most out of your colorful burst. 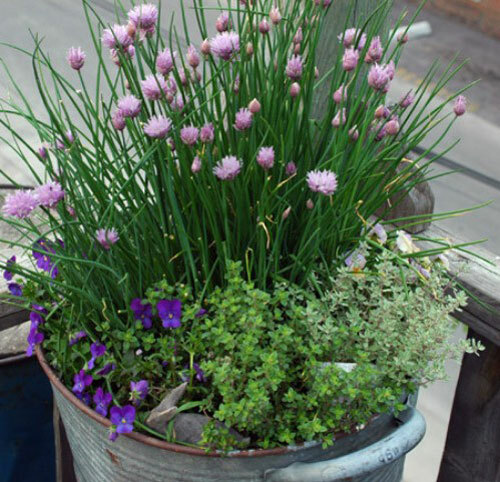 Midwest folks can use larger container that over-flow with flowering plants. The routine for these kinds of mixes include watering daily if necessary to keep the blooms full and bursting with color. Balance with a liquid fertilizer and keep plants pruned so that they don't become root bound. Simply lovely.